How do Shower Filters Protect Your Health? Chlorine is re-vaporized in the shower, inhaled into the lungs, and transferred directly into the bloodstream. In fact, the chlorine exposure from one shower is equal to the chlorine you would ingest from drinking a day’s worth of tap water. 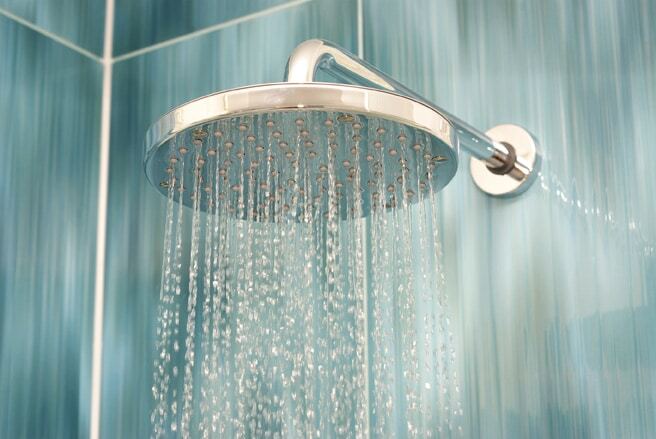 The heat in your shower opens your skin’s pores. This allows your skin to absorb chlorine and other harmful chemicals in the water. This can cause skin damage and make existing skin problems worse. You’ll breathe easier when you’re not inhaling concentrated chlorine in every shower. You’ll see improved skin and respiratory health and possibly more overall energy. You’ll have smoother skin and softer hair within a week of installing a shower filter. Chlorine dries skin and hair by stripping it of its natural oils. 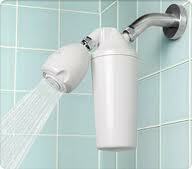 After installing your shower filter, your skin and hair will take about a week to replenish their natural oils. To effectively filter your shower water, choose a filter that contains both KDF and a complementary filter media, such as high quality carbon or Chlorgon. Most water filters contain carbon filtration. However, carbon alone is not enough for a shower water filter and a small carbon filter cannot handle the volume of water that passes through a shower water filter. For carbon alone to work, the filter would need to be so big it couldn’t be attached to your shower head. Thus, KDF is the key to effective shower filtration. KDF is a finely granulated alloy of copper and zinc, which removes or neutralizes chlorine, iron, dust, sediment, balances the water pH and softens it. 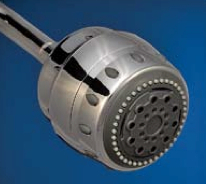 KDF-55 (used in Sprite shower filters) reduces surface tension while removing damaging minerals, giving you softer water. This means you’ll rinse cleaner – and so will your shower. Soft shower water will help your shower stay clean longer, so you’ll also spend less time cleaning. Also, don’t buy a filter that puts a carbon cartridge before a KDF-55 cartridge. Activated carbon takes oxygen out of the water, but the KDF needs oxygen to work properly. KDF is a mixture of copper and zinc. When water flows through KDF, a tiny electrical charge is created. This electrical charge forces free chlorine to combine with minerals in the water (usually calcium or another alkaline mineral). The combination of chlorine and these minerals is a harmless chloride. KDF is most efficient at warmer water temperatures typically used in the shower. Carbon removes impurities from water because it has a sticky surface. Carbon media comes in many grades but a high grade must be used in the shower because of the warm water temperatures. Carbon is primarily a cold water filter. It is most effective at temperature ranges of 50-80 degrees (F). So at higher temperatures, carbon needs to be used as a second-stage filter. Chlorgon converts free chlorine and some combined chlorines into harmless chlorides. Chlorgon is very efficient at a wide range of water temperatures, so it’s a great combination with KDF. Crystals, Magnets & Mineral Balls are used to soften water by reducing the size of the clusters of water molecules. This makes the water feel softer and makes soaps and shampoos sudsier. Let’s have a look at shower filters that use each of the above filtration mechanisms. Aquasana shower filters have a unique two-stage filter process for the healthiest shower possible. Stage 1 removes chlorine and enhances pH balance with a natural copper/zinc mineral media called KDF-55D. The second filtration stage uses a carbonized coconut shell medium for the removal of synthetic chemicals, THMs and VOCs that vaporize from tap water and are inhaled or absorbed through the skin, potentially causing adverse health and cosmetic effects. If you’re sensitive to chemicals, or have a respiratory illness, activated carbon can make a noticeable difference by filtering volatile organic chemicals (VOC’s) and trihalomethanes (THC’s) from your shower – as well as chlorine. Sprite shower filters use KDF and then Chlorgon as a second stage filter. They remove chlorine, iron, dust, sediment, balance water pH and soften water. The main difference between the various Sprite shower filter models is how long the filters last and the design features of the shower head. All Sprite shower filters are certified to NSF Standard 177. Removing these elements from your shower will not only result in healthier skin, hair and lungs, your shower will also be easier to clean since these filters soften the water and balance the pH. Sprite Bath Ball filter uses KDF and mineral balls to remove chlorine, iron, dust, sediment, soften your water, and neutralize pH. In my house, we have the Aquasana shower filter on one shower, the other two showers have Sprite filters – the Royale is my favorite – and we have a Sprite Bath Ball for the bath. Of course, in a pinch, you can fill a bath using your chlorine filter on your shower, but this takes a long time and you lose a lot of heat from the shower spray and distance the water has to travel before reaching the tub. The only points to keep in mind with this bath filter is that (a) your bath faucet has to be straight (like the one in the photo) and cannot be curved – otherwise you cannot attach the filter and (b) you need to be able to adjust the flow of water coming out of your bath faucet. The water flow from your bath tap into the filter has to be slow enough so the filter has time to filter the water, without it overflowing. If you’re unsure as to whether removing chlorine is necessary for you, I encourage you to just try one shower filter and see/feel the difference in your skin, hair, lungs, etc. ← Which of Jini’s books is right for me? Shower filters and water softeners are the best way to get soft, healthy, pure water that won’t dry out your hair or skin. Are there good filters for the bathroom faucet? I’ve seen lots made for the kitchen tap… but they (1) don’t seem to fit in the bathroom correctly and (2) aren’t supposed to be used with warm/hot water. Thanks! Also– I did just get a Sprite filter for my shower–a Slim Line, I believe. It was surprised how easy it was to install! And it really doesn’t take away from the pressure at all, which I understand can be a concern for some. Which bath filters remove the Monochloramine or Chloramine & Chlorine from the water? SIBARAM – it seems to be a tricky feat to remove chloramines from water, since the water has to remain in contact with the filter (carbon) for quite some time for this to be removed. I’m not aware of a shower or bath filter that can do that. It seems that you would have to get an at-source, whole house filtration system first. “Shower filter technology is a challenge. Filter carbon, which is the hands-down champion at chlorine removal in drinking water filters, has limited effectiveness in shower filters, where a small amount of the filtering agent is required to handle a large amount of water that goes through the filter very quickly. An added challenge is hot water, which carbon doesn’t handle well. Because of these problems, most shower filter makers rely on a filtering medium called KDF. KDF is a granular metallic substance that under proper conditions converts chlorine to harmless chloride. Shower filter sellers typically show impressive charts that demonstrate long-term removal of chlorine. However, if you read the tests carefully, you’ll see that they apply to “free chlorine” (chlorine that has not combined with other constituents of water). Many water suppliers now use chloramines, a blend of chlorine and ammonia, and there is little if any “free chlorine” in the water. Sprite adds a patented mineral salt medium called “Chlorgon” to the KDF in its shower filters in an effort to deal with certain forms of combined chlorine. No claim of chloramine removal is made. What about vitamin C filtration for showers? What are your thoughts on this method? I have tried a Carbon + KDF filter but where I live the Chlorine is so strong the filter wasn’t very useful. When I had a bath I tried adding vitamin C and it removed the horrible chlorine smell. Hi there, I am really struggling to find a shower filtering I feel is the best one, I don’t know what brand to trust. I have cancer and I have changed so much to get my health restored, just need a little help with choosing the purest shower filter, can u help me please. The only shower filters Jini recommends are the ones in her blog post above so you might want to try one of them out if you haven’t already. I am also interested in the Vitamin C filters. They are said to remove chlorine and chloramine. 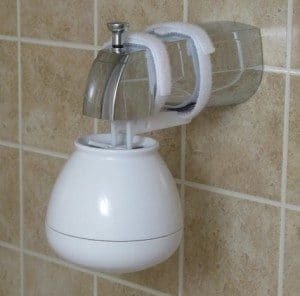 I have seen a Sprite shower connected to vitamin c filter connected to shower head. Although some just use the vitamin C filter. What are your thoughts? My hair has turned green, I believe this is from copper in the water. Which shower filter is best for this? If copper is the cause, these filters will likely not have any effect but if the cause is chlorine then they will. Generally speaking, shower filters that claim to have an effect on copper content tend to be much more expensive than the others and usually only claim to “significantly reduce” copper rather than remove it completely. Dr. Mercola sells one such shower head + filter for around $100 with 6 month replacement filters around $55 each. HI THE PROBLEM WITH MY WATER IS THAT IT REALLY STINKS LIKE COPPER OR IRON ORDER….WILL THESE FILTERS WORK MY PROBLEM? If you purchase a filter with KDF, it may have an effect on the iron odor as the KDF is designed to remove iron (among other things) from the water. Regarding copper, please see comment #12 above. Someone posted above, but I’m also curious about filters for bathroom sinks. I’ve seen them from the kitchen sink, but it says they should only be used with cold water. Suggestions? Nic – good question… I wonder if the kitchen filter components are not approved for high heat use? Also, I believe in the under-sink hookup you only hook the filter up to the cold water line. So perhaps it is a functional restriction as well? I loved and relate with you on the filtered shower head video! Very well done comparison! Let us know which pitcher you end up going with! I was wondering which shower filter should be selected in the case of removing the chloramines as mentioned by Jini above. I understand the shower filters mentioned above only remove chlorine…is that correct? Also I am looking to get a benchtop reverse osmosis for health reasons. From the information I have been able to fine – the Ro does not remove the chlorine along with fluoride, would you agree with this information and should I use a tap filter like the shower filter to first remove chlorine? Hi… i just need a filter to get my well water not to be brown. I think it is iron deposits, but not sure. If we use too much water, then when filling up the tub, its brown! not to mention all my whites are dingy white! Just want to confirm that the sprite might be the best vs. the Aquasana shower filters. Also, the water pressure is not all that good right now, so this means it will be even worse? Jini would love to hear your thoughts on the filters once you try them! Will the carbon filters work with a soft water system? We don’t have any reason to suspect that they would not since it would just be an additional filter in line with the already filtered soft water. Thanks for the advise! I bought me and my mom a Sprite Royale, and we love it and notice the difference. Less chlorine. I got mine at Lowes Home Improvement. I live in Mozambique, and we have a well. The water is salty and sometimes stinky. What’s the beat filter for my family? If you’re talking about a filter for drinking water then I’m afraid that’s beyond the scope of this article but Jini recommends the Sprite brand if you are looking for filters for your shower or bath. I had a water test done at my home showing Calcium in my water. Suggestions for filters for the shower, bath tub and bathroom sink? Just to let you know… KDF shower filters do NOT filter out chloramines… only chloride. Check with your local municipal water system to find out if your water has chloramines in it (many do). If you have chloramines, they are just as bad for you as chloride is so get a filter that renders chloramines inert… like the vitamin c shower filters. Read up on them and I’m sure you’ll make a very good choice for your environmental safety. Thanks for the comment! Yes, we are aware of that (please see comment #5 above from Jini). We’d love to hear more about the filters you’re talking about. If you you have any links to share where we can read more, it would be much appreciated. Also, do you have them installed in your home? to Lisa from above post…did you find something that removes calcium? I have really hard water, leaving white stains on my new brown tile. I suspect it is calcium or magnesium. I need a showerhead filter but I haven’t found a solution yet. Please let me know if you have. I just bought an Aquasana shower filter. Can I use the TDS meter to test whether the filters is really doing its job and when it is time to change the cartridges? Theoretically, yes, your TDS should show a difference if it is accurate enough and if there is enough calcium, iron, dust, and/or sediment in your water to be measurable. Let us know how it goes! Thanks for replying to my qn. I am using the TDS-EZ Water Quality Tester. Tap water without shower filter 79ppm. Warm tap water with shower filter 88ppm. Cold tap water with shower filter 81ppm. I repeated this three times over and got the same results. (1) Shouldn’t the ppm for filtered water be lower? (2) Ppm gap appears to be rather disappointing? (3) Any idea why there a difference in ppm when warm water is filtered vs cold water? This Aquasana shower filter uses COCONUT SHELL CARBON to reduces chlorine and synthetic chemicals. And a PATENTED COPPER/ZINC MEDIA to further reduces chlorine and enhances pH. how and where do i buy the sprite all in one shower filter? i cant seem to find a website that selles the sprite royal all in one shower filter. Hi, we have a shallow well that when we first moved in five years ago made myself, Sig. Other and all the dogs have to problems! We started d packing in our drinking water. From a natural spring. We still do to this day. My question is with well water testing low ph on, is there a shower filter that would be beneficial? If your goal is to neutralize the pH of your shower water or remove chlorine, iron, dust, and sediment then the filters above could be beneficial in your case. If none of these things are a concern, you may need to find a different solution. Will a filter actually work on hard water? Or is a water softener the only way to go? Also, a Vitamin C filter can remove chlorine but NOT CHLORAMINE! This is completely false information. See for yourself by visiting the chloramine.org website. Go to “Chloramine Facts” then read the section on Filtration. Unfortunately, there is no shower head filter that is able to remove chloramines. chloramine.org is a decade old, and does not mention at all that it even considered vitamin C as an option. Hi there, thanks for the great information on shower filters. I find the chlorine-eczema connection to be very interesting. We suffer from eczema in our house as well. I’ll definitely look into a shower filter! I have developed severe eczema on my hands after the water level in my well on my rural property dropped due to prolonged drought in the desert (no treated “city water” here) and I am pretty sure my that the water which was already high in calcium and other minerals has gotten harder as a result. I need a shower filter to remove the minerals, there is no chlorine to be removed. For a number of reasons I do not want to install a water softening system for all the water I use, since most of it doesn’t come into contact with my body, but is used for irrigating trees and filling water troughs for horses and doing laundry. What would be the best shower filter/system to purchase for my situation? If you have any other questions, please let us know. We would love to hear how they work out for you. Hi, Thanks for your article. I appreciate the helpful information. It sounds like your preference is with the sprite shower filter is that right? I’ve had aquasanna in the past. Do you think Sprite is better? Does sprite have a handheld version? Didn’t see one on your website. What are your thoughts on the Sonaki Vitamin shower filter? Incredible. I’ve known for a long time how important it is to filter your drinking water, what with all the contaminants/etc in it nowadays, but I had no idea I should be filtering my shower water as well… I guess I didn’t realize the water had gotten that bad. I’ll definitely have to give a shower filter a try. The thing I really love about this is that it turns water filtration into an art piece of sorts. You could also trip out your guests by sitting this out on the table and having it look like a table decoration, and then suddenly you start pouring them glasses of water with it. Anyone ever experienced hair breakage due to metals leaching from old pipes? What would be the best shower filter for that? 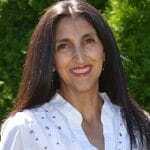 My mom dealt with psoriasis her whole life… it pains me to think that perhaps the solution that entire time was as simple as a filter on our shower. I’ll definitely be getting one myself the next time I go to the store.